These gowns are reminiscent of the French influence worn for colonial America, Les Miserables and pre-colonial days. Satin and solid color cottons available at the listed price. Some printed fabrics, brocade and silk are available and may have an additional fee. 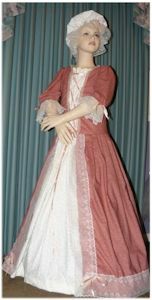 This beautiful colonial tea gown will be perfect to wear on a trip to Colonial Williamsburg Virginia! The gown is slightly adjustable in the front, buttons in the back. The full skirt looks like 2 skirts, but is actually 1 skirt. Bottom of sleeve adjustable. Beautiful lace trim and mop hat included! Shown with a petticoat, not included. This gown was styled for a Les Mis production. It has an above waist apron that ties in the back. The dress is adjustable around the neckline and mid sleeve. A mop hat is included! Beautiful wide lace and puffed sleeve that is adjustable above the elbow. Then long slender sleeves extend. Neckline and skirt are adjustable. Sash ties in a beautiful bow. Shown with a petticoat, not included. This beautiful gown has 2 pieces. The bodice has an inset in the front and hidden buttons on one side of the front. The skirt is adjustable. Made to look like 2 skirts, but is only 1 skirt.